Real stories of sustainability in local communities are powerful examples of the actions that humans can take to make a difference. Very useful in a discussion of sustainable agribusiness and humans taking action to reduce their contribution to climate change. Great tool and story to begin sustainable practices and/or energy conservation and/or renewable energy discussions. Provokes further research. Jock and Buzz Gibson are the managers of Lochmead Dairy Farm, a fourth-generation, family-owned dairy farm in central Oregon. For the past 50 years, the dairy has demonstrated wisdom in thinking locally and reducing its carbon footprint in an industry that is typically a heavy emitter of greenhouse gases. The video briefly discusses the business decisions they've made to reduce their impact on the environment. 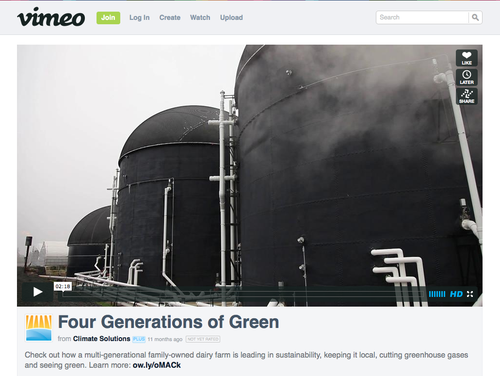 Video can also be viewed at Climate Solutions website [link http://climatesolutions.org/solution-stories/four-generations-of-green], which gives a more thorough description of the conservation efforts the family has made. Engaging story told by 2 members of the family; it is illustrated with scenes from their production and waste management facilities. Can be viewed in high definition on desktop screen or projector.